Fans of match-three games on Facebook likely know the frustration of playing their favorite game, only to run out of lives and be forced into a waiting game before they can continue playing. That’s why it’s so nice to have multiple other games to play while we wait. Now, yet another option is now available, in Nika Entertainment’s Magic Kitchen. 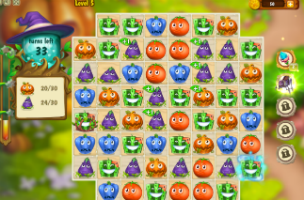 Magic Kitchen greatly resembles King’s Farm Heroes Saga, as players complete levels by making matches with fruits and vegetables around the farm. Each level has a different requirement and move limit, and asks players to collect large numbers of specific kinds of crops. Players have access to power-ups to help them out, like a magic wand for removing one chosen crop from the screen, or a locust that removes all crops in a single row. Some crops are also quite special, and will remove large chunks of crops from the board when activated (these count for quest completion). Gamers earn up to three stars on each stage, and can compare their scores against their Facebook friends before they begin. Magic Kitchen is supported by a lives system, as well as premium currency for purchasing additional power-ups. Magic Kitchen is available to play for free on Facebook. It has over 50,000 monthly active users and climbing. The game is also available to download on Android.